This key text for the building team is an authoritative guide and gives a detailed account of the team's roles and responsibilities, with best industry practice required to ensure that building projects meet clients' expectations on time, cost and quality. 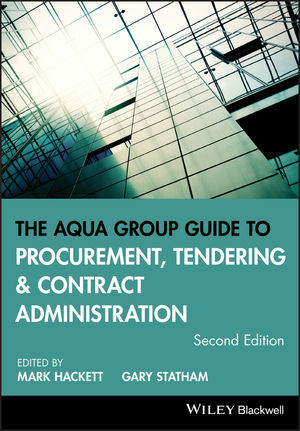 The second edition of The Aqua Group Guide to Procurement, Tendering and Contract Administration has been edited, enlarged and updated by a high-profile author team with unparalleled experience of both private and public sectors, as well as of teaching on QS courses. It covers the entire building process from inception to final account and throughout, the emphasis is on current best practice. This edition has new material on the CDM regulations; JCT contracts; the RIBA Plan of Work; the RICS New Rules of Measurement; BIM; and Sustainability - as well as a general update for industry changes, especially on procurement; internationalisation; and PFI. With clear and thorough explanations, you are taken through self-contained chapters covering the detail of the briefing stage, procurement methods, tendering procedures, and contract administration. The period from starting a college course to successful completion of professional examinations represents a long and steep learning curve. The range of skills and the knowledge required to perform work efficiently and effectively might, at first, seem rather daunting. Although designed as an introductory textbook for undergraduates in construction, architecture and quantity surveying, The Aqua Group Guide offers an excellent overview of contract administration and will provide you with sufficient understanding to hold you in good stead for your early years in professional practice. Mark Hackett, Senior Partner, Mark Hackett Associates, LLP. Gary Statham, Partner, Mark Hackett Associates, LLP.